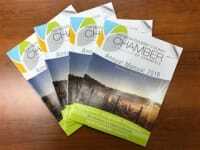 Welcome to the Montgomery County Chamber of Commerce! Since 2003, the Montgomery County Chamber has served Blacksburg, Christiansburg and Montgomery County, Virginia. The Montgomery County Chamber promotes a positive environment for the operation and growth of business in our community. The Chamber and its board of directors believe the planning process is essential to the long-term success of the organization. Moreover, while the strategic direction sets the direction for the Chamber, it is the annual work that becomes the action plan for achieving goals. Board members have identified elements that will strengthen the Chamber’s role in the community and align with mission and vision of advocacy through our logo and brand - Connect, Engage and Prosper. The Montgomery County Chamber of Commerce will advocate for the best interests of the business community and demonstrate our Chamber’s commitment to making our community the best in the region. Beginning in February 2019, this ten-session program offers an in-depth look at Montgomery County while examining leadership skills that are critical to prospering businesses. Take a look at our 2018 Annual Manual.